Senior Fatah official claims Israel doesn't want peace, threatens PA will redefine its relations with Jewish state. 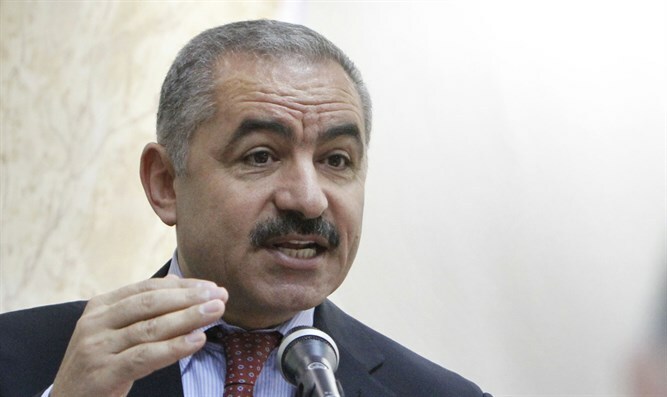 Mohammad Shtayyeh, a member of the Fatah Central Committee, said Saturday that the Palestinian Authority (PA) leadership was working to redefine relations with Israel on the political, security, legal and economic levels. In an interview with the official PA news agency Wafa, Shtayyeh said that the political track is now closed because there is no partner for peace in Israel. "For us, as a Palestinian people under occupation, Israel is neither a partner nor an ally," said Shtayyeh, adding, "Israel is occupying our land and the occupation must end. We have the right to fight it and the Fatah movement adopted the popular resistance against the occupation and we have a strategy on this issue." He noted that the Palestinian Authority had established a committee to reexamine the issue of recognition of Israel, and when the work of the committee concludes, the PA would freeze recognition of Israel, cancel it or accept another proposal on this issue by the legal committee. According to Shtayyeh, the Palestinians want a two-state solution, but Israel leads to the actual situation of one state in which a Jewish minority controls a Palestinian majority. PA chairman Mahmoud Abbas has continuously rejected Prime Minister Binyamin Netanyahu’s call to sit down for peace negotiations, and has instead chosen to impose preconditions on talks with Israel. Abbas has also rejected the Trump administration’s peace plan before it has even been unveiled. The PA chairman has been boycotting the US ever since Trump’s recognition of Jerusalem as Israel’s capital last December.